The government of Canada is continuing to invest in advanced technologies throughout the country in efforts to bring innovative products, processes, and services to market. Recently, 17 organizations in British Columbia have been awarded funding for innovation, which they will use to develop, advance, and commercialize their products and services. This support will help BC and Western Canada compete and grow, both nationally and globally. A combined total of $19,772,811 has been awarded to 17 British Columbia companies from the Western Innovation (WINN) Initiative. The Western Innovation (WINN) Initiative was a government funding program designed to help innovative SMEs in Western Canada move their technologies from the later stages of research and development to the marketplace. WINN has been closed since November 2017 and is not expected to reopen. Businesses in Western Canada are now encouraged to look into the Western Business Scale-up and Productivity (BSP) Program. Similar to WINN, the BSP program helps businesses with high growth potential to adopt/adapt innovative technologies that grow operations, support productivity, and increase exports to global markets. Although the Western Innovation (WINN) Initiative no longer accepts applications, companies who received funding from the program are still being announced. WINN has invested just under $20M in funding for advanced technology to 17 organizations in British Columbia. The Western Innovation (WINN) Initiative was a government funding program that supported Western Canada companies with repayable funding to accelerate technology-based product development and help those products reach market readiness faster. The Western Innovation Initiative provided up to 50% of eligible project costs to a maximum $3.5 million in repayable funding per project. Some of the projects that were available for WINN research and development funding were product certifications, technology development and acceleration, pilot and technology demonstration projects, and validation of market potential and end-user acceptance.While this program is no longer accepting applications, businesses in Western Canada have other incentives available to help drive their technologies to market, such as the Business Scale-up and Productivity (BSP) program. The Business Scale-up and Productivity (BSP) program supports organizations in priority areas to scale-up, commercialize products/ services, improve productivity, and develop and expand into both domestic and global markets. The BSP program provides a repayable contribution (no-interest loan) of up to 50% of eligible project expenses to a maximum $5 million per project and $10 million per applicant. Companies must maintain profitable operations in Western Canada (British Columbia, Alberta, Saskatchewan, or Manitoba) and eligible projects must focus on digital technology, advanced manufacturing, clean technology, value-added agriculture, clean resources, or life sciences. The Business Scale-up and Productivity (BSP) program accepts applications during defined period intakes. The program is currently open and the next deadline to submit is January 11, 2019. 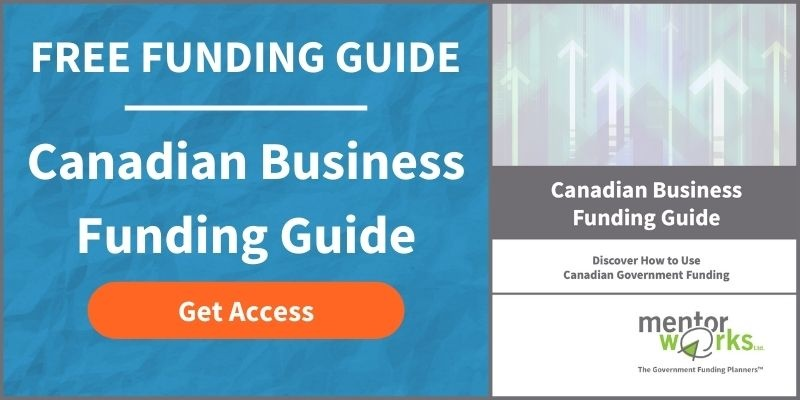 Businesses interested in learning more about the government funding landscape are encouraged to download Mentor Works’ Canadian Business Funding Guide.